You heard shirataki noodles are healthy -- low carb, low calorie, and gluten-free. People have eaten and enjoyed them for hundreds of years in Japan. And yet, you find yourself nervous about prepping or cooking them. Psst, we have some secret tips for you! When you first open shirataki noodles, you'll be met by an "ocean-like" scent. Don't be alarmed. The scent comes from the natural alkaline water in which the noodles are packed. It's what keeps them fresh and ready-to-eat with no preservatives or refrigeration needed*. Secret Tip #1: After opening the package and draining shirataki noodles into a colander, sprinkle the noodles with 1-2 teaspoons of vinegar. Let stand 2-3 minutes. The acid of the vinegar instantly neutralizes the natural alkaline water and its scent. Now rinse the noodles thoroughly. Voila! All you're left with is fiber-rich shirataki noodles to fill you up without extra carbs or calories. But if you're new to shirataki noodles, you might be asking yourself: What's the best way to prepare them? Secret Tip #2: The Pan Fry Method. After you drain and rinse the noodles, pat them dry with a clean paper towel. Cut them to a shorter length if you like. Using tongs, stir and separate the shirataki noodles over medium-high heat for 2-3 minutes until they "squeak." Pan frying the noodles removes most of the moisture and the gummy texture some dislike. Now toss with your favorite sauce. Many shirataki fans prefer cheese-based or Asian-style sauces over those that are tomato-based. Secret Tip #3: Use shirataki noodles and shirataki rice in soups. If you don't want to hassle with the Pan Fry Method above, the simplest way to enjoy shirataki noodles and rice is in place of regular pasta or white rice in soups like chicken noodle, minestrone, pho, ramen, and chicken & rice. It's a quick, easy way to cut carbs and calories instantly. Get shirataki soup recipes on our website here. 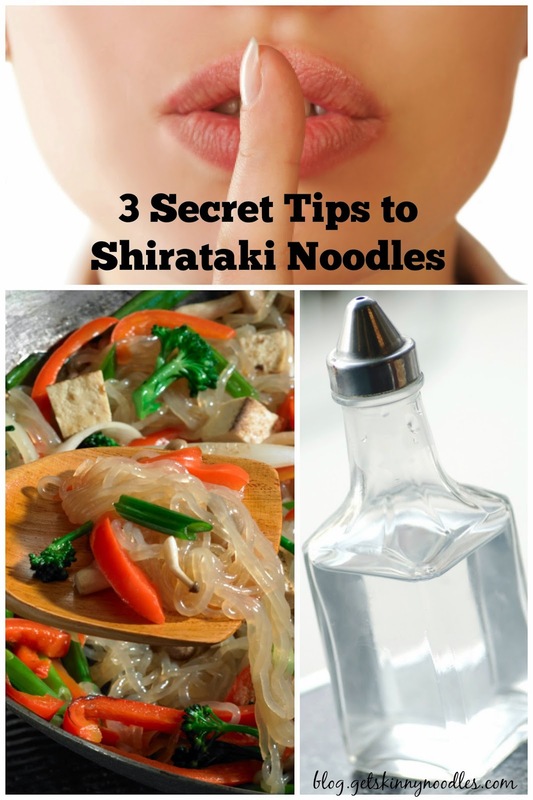 Bonus Secret Tip #4: Did you know you can use shirataki noodles in the slow cooker? That's right. Just drain, rinse, and add to the slow cooker during the last 20 minutes of the cook time. And because they are a good source of fiber, shirataki noodles basically cannot be overcooked. That means you'll never have to eat mushy noodles again. Read more about shirataki and slow cookers in our recent blog post here. *Note: Traditional shirataki noodles like Skinny Noodles brand do not contain tofu/soy. Some other shirataki brands add tofu in order to make the noodles more white in color like traditional Italian pasta. Shirataki made with tofu/soy has extra carbs and calories and requires refrigeration. Skinny Noodles brand shirataki is soy-free, paleo friendly, and made in the USA. Very nice post. This is very useful. Thanks! These noodles are great and have done wonders for my diabetes numbers WONDERFUL replacement for Pasta !!!!! You only want to add them to the slow cooker for the last 20 minutes? Will they come apart if they are in the slow cooker for the full time? Thanks to the high fiber content of Skinny Noodles, they can be left in a slow cooker for extended period of time without issues. You can add them in the last 20 minutes or 3-4 hours before on high with no problem.